Our Winter Picnic hamper is quite simply the perfect excuse for an evening of seasonal indulgence. We have collected a delicious selection of treats into a stylish wicker basket. 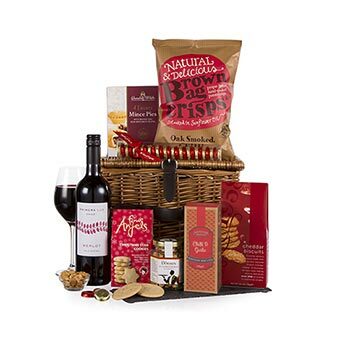 These treats include Chilean Merlot and Farmhouse Chilli & Garlic Savoury Biscuits, Hand Cooked Oak Smoked Chilli Crisps from Brown Bag and, dry roasted peanuts from The Dormen. Treat someone special to a really special gift this Christmas. Disclaimer Please note that for delivery on Saturday or Sunday there is an additional fee. Delivery on Saturday - £10.99. Delivery on Sunday - £19.99.